Working in the city often means that newly planned civic spaces must take into account the structural constraints of the building program that exists below. Whether it’s a new green roof atop a building– or a street-level plaza on a structural slab– when design in urban destinations, designers must negotiate architectural structures below grade, such as parking, vaults, programmed architectural uses or utility infrastructure. As many cities across the globe add gardens, performance spaces, plazas and parks in unexpected places, the primary challenge is how these landscapes will impact aging infrastructure. Although planting above structure can present design and execution challenges, providing access to green space in the city has become an important aspect of urban development; improving general health and wellness for city dwellers in their daily lives, fighting urban heat island effect, and creating resilient landscapes that artfully manage stormwater. These landscapes provide an important oasis– especially for our most vulnerable populations. To mitigate increased temperatures, plant material is a natural insulator for these structural roofs, which can reduce energy demand, air pollution, greenhouse gas emissions, and increase water quality by strategically designing runoff and flooding within the city; thereby putting less pressure on urban infrastructure. Planting large and even small trees and establishing suitable growing conditions above structure can pose challenges related to limited depth and weight restrictions. Our team has developed innovative ways to overcome these challenges with the use of customized lightweight soils, vegetated roof assemblies, and integrated raised planter solutions that maximize soil depth with unique soil profiles. An example of this can be seen at the Prudential Center Plaza, which is sited above an existing parking garage with strict structural limitations. Our team utilized the latest technologies to tailor custom, raised granite planters and benches that are strategically sculpted (both from the top and bottom) to meet weight requirements. 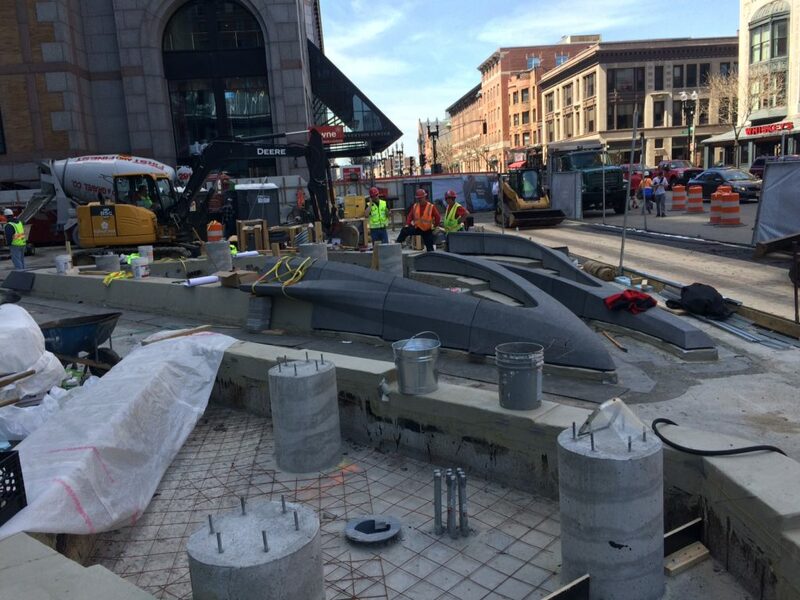 This cutting-edge process incorporated the latest tools in software and construction interface to create a landscape that fits the structural needs of the site while maximizing the soil depths of the large gingko trees along Boylston Street. In a number of our other roof gardens in Boston and New York City, we’ve depressed the structural slab in targeted areas to create tree pits to provide additional soil volume to ensure trees’ long-term health. Leakage is one of the worst problems a building can experience; careful attention to waterproofing and drainage details is one of the most critical elements in a successful over-structure landscape. Our technical team has worked closely with waterproofing specialists to understand each layer of an effective waterproofing system and how the design of landscape elements above should interact with these systems to allow proper water movement and minimize any risk of leakage to programmed space below. Architectural elements such as benches, planter walls, lighting and curb walls within the landscape are always designed strategically to minimize punctures through the waterproofing system. When our team designed the Green Roof Healing Garden at Boston Children’s Hospital on their current Main 11 Building, we worked with architects and engineers to construct a new garden above sensitive, occupied clinical space. 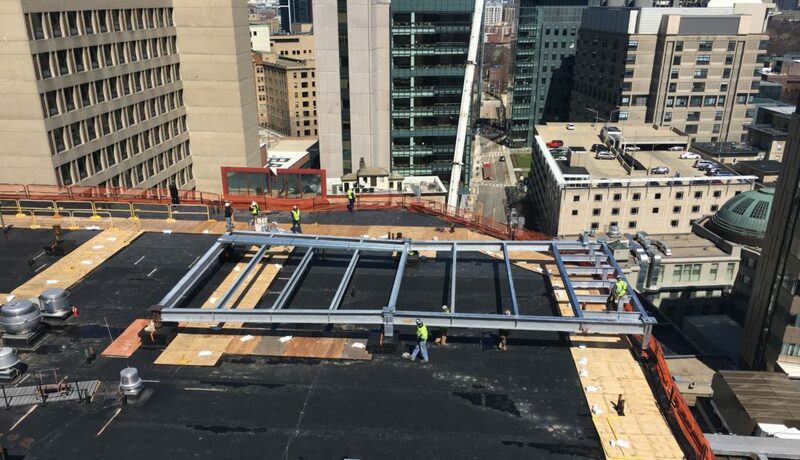 In order to provide patients and families with a more accessible restorative garden, a fully waterproofed structural slab was constructed on top of the existing roof to increase the structural capacity and maintain access to mechanical equipment on the roof. The client’s investment in this new, 8,000 SF garden included extending the elevator system up to the 11th floor to make it accessible, and adding a lobby, bathrooms, and storage. These complexities are an important part of the design of urban landscapes and require careful consideration during both concept design and execution. As life in the city becomes more stressful and intense, cities and developers will continue to look to create more spaces for respite in all sectors of urban development; from residential to workspaces, from hospitals and senior living centers to educational institutions, and from recreational and retail hubs. The idea of creating places for health and wellness shapes all of this work as we try to make our increasingly crowded cities more livable and healthy.